The version amended by the Committee on Internal Affairs which was finally adopted states that the deployment of undercover agents has now become “indispensible and long overdue”  for the central policing duties the Federal Police has assumed for 20 years now. In the debate over the bill, the President of the Federal Police, Dieter Romann, also spoke out. In a statement submitted late he cited the phenomenon of “illegal migration” as justification for the need for statutory undercover threat-prevention powers. He stated that the Federal Police was no longer in a position to sufficiently counter the tactics of “smuggler organisations” “using traditional, conventional methods”. “People smugglers” acted “highly conspiratorially, with division of labour, shielding themselves from police actions to a large degree”. Witnesses and victims, he claimed, were “intimidated with violence or coerced into giving false evidence”. “The most deaths”, he said, were in the area of organised crime, which “illegal people smuggling” is subsumed under. For this reason the preventive deployment of undercover agents by the Federal Police was a “tactical requirement”. This included, he went on, “discretionary investigations”. Such a possibility existed in almost all of the police laws of the Länder, or federal states, (with the exception of Schleswig-Holstein) and in the Federal Criminal Police Office Act and had proven successful. According to the President of the Federal Police, his institution has already made use of assets on a larger scale. They were deployed, he said, in response to “repeated people smuggling operations by ship from Turkey (Mersin) to Italy”. The Federal Police set up a fact-finding commission for this purpose (“WAVE”) and maintains several informants in the scope of this. It is likely that refugees were also recruited for this. Ultimately, according to Romann, the information acquired covertly led to “extensive knowledge of previous and upcoming ship smuggling operations”, whereupon “imminent smuggling operations” were prevented. Here, he is referring to arrivals by relatively seaworthy cargo ships from Turkey. In winter 2014, the two decommissioned ships “Ezadeen” and “Blue Sky M” reached Italy with around 1,300 mainly Syrian refugees. The ships probably put out to sea in Mersin in Turkey, approximately 100 kilometres away from the Syrian border. 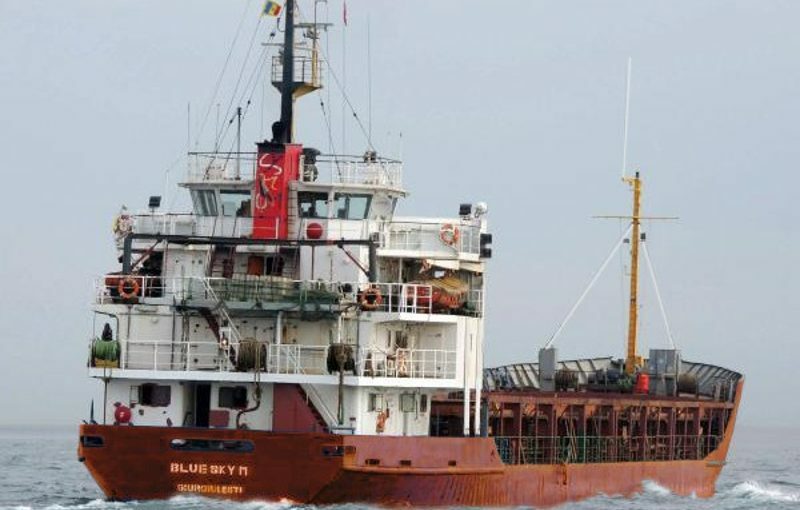 The Federal Police repeatedly uses the term “ghost ships” for this phenomenon; the Federal Ministry of the Interior has distanced itself from this, however. At the start of 2015, arrivals from what are now termed “major people-smuggling operations using cargo ships” came to an abrupt stop. According to Romann, the Federal Police is responsible for this – thanks to the information from its assets three ships were captured and impounded, preventing 1,100 people from making the crossing to the European Union safely. The measure was executed by the Turkish security services, which means the Federal Police passed on the covertly acquired information to Turkey. It is not clear which Turkish authority conducted the raids; the military Jandarma is responsible for border control there, whilst in the cities the Turkish National Police is in charge of this. The Federal Police’s international investigations then also led to a series of raids in Germany. In autumn 2015, 24 buildings were searched in Lower Saxony, North-Rhine Westphalia and Baden-Wuerttemberg. 17 defendants are accused of having brought refugees from Lebanon and Syria to Germany. In January this year, 493 police officers in Schleswig-Holstein, Lower Saxony, North-Rhine Westphalia, Berlin, Brandenburg and Bavaria stormed 16 homes and one business premises. Five arrest warrants were executed; during the searches of ten flats in Turkey conducted at the same time, ten suspects were arrested. According to media reports, in addition to the Turkish National Police, the special units GSG 9 and BFE+ were also involved in the operation. In summer the Federal Police conducted raids in Berlin, Lower Saxony and North-Rhine Westphalia, the defendants stand accused of smuggling people through Turkey, Bulgaria, Serbia and Macedonia to Hungary and then onwards via Austria to Germany. The German Foreign Intelligence Service is also involved in investigating “illegal people smuggling”. The President of the Federal Intelligence Service (BND), Gerhard Schindler, warned of an “international human smuggling network”, which he said “extends across Turkey all the way to Greece, Italy and France”. The information is presumably from the since restructured “Main Questioning Office” of the BND, whose staff question refugees and asylum seekers without disclosing the fact that they are from the secret service. The information thus acquired is passed on to foreign partner services. Many of the cross-border measures against “people smuggling networks” are coordinated by the EU law enforcement agency Europol. The Federal Police is also involved in the joint fact-finding groups set up for this. Recently, the raids conducted under the leadership of the Italian police, Europol and the agency for judicial cooperation Eurojust on 6 September led to 16 people from Syria, Algeria, Egypt, Lebanon and Tunisia being arrested. The Federal Police wrote on this subject that 25 “ring members” had been identified who had helped 1,115 people enter Germany and Austria. Europol also helps with investigations against suspected “people smugglers” abroad. At the request of the Federal Police, with the help of the Hungarian police and Europol, two men were arrested in Budapest at the end of August this year, for instance. One of the most important operations under Europol will have been the raids at the start of 2015 though, in which police from several Member States of the European Union cracked down on the suspected culprits behind the freighters which back then were still referred to as “ghost ships”. Eleven suspects were arrested following searches of 44 homes and business premises in nine Länder. International joint investigations by the Federal Police deploying undercover agents could also take place through new institutions at the level of the European Union. The Federal Police is working with the “European Migrant Smuggling Centre” (EMSC) launched by Europol in February 2016. The Federal Police is also part of the “Joint Operational Office against Human Smuggling Networks” (JOO) in Vienna, which also cooperates closely with the EMSC and again is part of Europol. The German-Austrian “Police Cooperation Centre” in Passau was also established for the purposes of combatting “illegal people smuggling” transnationally, which the Federal Police and the Bavarian Police second liaison officers to. Involvement in international working groups? According to the President of the Federal Police, only by deploying undercover agents can “smuggling operations already [be detected] abroad” at an early stage and targeted measures be taken in time, including the “intensification of the intensity of checks or a cross-border exchange of information”. The improvement of cross-border covert observation is being developed at the level of the European Union in the “Cross-Border Surveillance Working Group”, in the scope of the “International Specialist Law Enforcement” project and with the “Europol Platform for Experts”. To date, from Germany the Federal Criminal Police Office (BKA) has been involved in the cross-border deployment of tracking devices or other surveillance measures. It is unclear to what extent the Federal Police is also to participate in these working groups in the future and engage in an exchange on technical issues relating to undercover activities. The BKA and the Customs Investigation Bureau (ZKA) are, furthermore, members of a worldwide and a European working group on undercover investigations (“International Working Group on Police Undercover Activities” (IWG), “European Cooperation Group on Undercover Activities” (ECG)). Countries like Albania, Croatia, Macedonia, Serbia and Turkey are also part of these. IWG and ECG meetings involve inter alia the “regular presentation of the current national situation” and the “examination of aspects of international cooperation on the basis of case studies”. It is conceivable that the Federal Police will also take part in the working groups in the future or have the BKA and the ZKA represent it in these. The role of the Federal Police in the context of joint undercover activities with criminal prosecution authorities from the European Union or also Turkey is also unclear, if this concerns the deployment or existence of undercover foreign police officers in Germany. In the past the BKA has been the relevant contact point for announcing and organising such covert operations. It is in charge of forwarding such requests to the relevant police services of the Länder. Standards for “Quality assurance in the use of undercover foreign police officers in Germany” were revised in 2012 and should now also apply to the Federal Police. In the digital sector too, the powers to conduct undercover activities are also to be expanded. In his statement, Federal Police President Romann explicitly cites communication activities by “smugglers” on the Internet and in social networks, including Facebook and Twitter, and on the “generally difficult to access so-called Dark Net”. Tools used in the past, including telecommunications surveillance, he said, were becoming less and less effective. In addition to penetrating organisational structures, the use of undercover agents would, the Federal Police President said, also enable information about communication methods to be intercepted at an early stage. Apart from the use of government malware (“Trojans”), the Federal Police also already uses “stealth SMS” messages to compile movement profiles for the owners of mobile telephones. Compared to the second half of 2015, the Federal Police’s use of stealth SMS messages has more than doubled in the first half of 2016 (printed paper 18/9366). It is not clear whether the increase is attributable to the investigation of international “illegal human smuggling”. In the period in question, the Federal Police also used so-called IMSI-catchers in 36 cases to localise and possibly tap mobile communications. Finally, the websites of profit-driven smugglers were increasingly targeted during investigations. The “Internet Referral Unit” at Europol is now also performing monitoring and possible removal of digital media contents. Initially set up with “Islamist terrorism” in mind, the department’s work remit has now been expanded to include “illegal people smuggling”. By its own profession, Europol is now taking action against websites of “people smugglers”. Europol has reported 122 accounts said to be linked to “illegal migration” to the providers for deletion. The user data in question is not identified by the “referral unit” but provided by the “European Migrant Smuggling Centre“, which the Federal Police is decidedly active in.